There will be 3 packet pickups the week prior to the race at the Fit2Run stores in Tampa & St. Petersburg. You can register for the race at packet pickup. 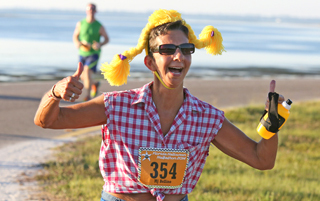 There will also be packet pickup and registration on race morning at Fort De Soto at 5:30 – 6:45 a.m.
We encourage you to pick up during the week to avoid long lines on race morning. You will need your ID. If you are picking up for a friend, please bring their a copy of their ID. If you are picking up for a group, it helps us tremendously if you have all the names written on a sheet of paper. This will expedite the process and keep the line moving. Extra points if the names are in alphabetical order! Though we try our best, we can not guarantee T-shirt sizes on race weekend. By picking up your packet earlier in the week, you increase your chance of getting the size you requested. The shirt size you choose when you register gives us an idea of how many Ts, per size, we should order. We place our order 3 weeks in advance of race day to allow for shipping and printing. We add a percentage to account for the runners who register after the order is placed. We hate to disappoint, but we don’t have a crystal ball to predict what size T-shirts the new registrants will require. Sometimes this skews our inventory. So, come early!